We all have an inner child. They're in there, sometimes buried really deep, but they're in there dying to play. Remember playing make-believe? Pretending to run a store? What about being an astronaut or an archaeologist? Right now my boys are big into the dinosaur thing. For the last few weeks they go out into our yard each morning to look for dinosaur bones. According to them they've even found a few. If you can't recall what it felt like to be a kid go to the nearest park and just sit and watch the kids playing. 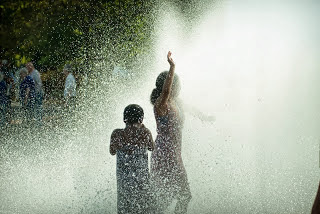 It doesn't matter how hot or cold it is, whether it's sunny or overcast, or even if they have friends to play with little kids will find a way to have fun. Just sit and watch them for a while. Now, what happened to you? Where did that fun little person that you used to be go? I bet he or she is still inside of you. Here's how to get them to come out. First, this is most fun to do with your spouse. Little kids can have fun by themselves but the fun is magnified many times when they play together. Make a date night out of it. Get out the coloring books and a box of crayons. Color a picture for each other. Pick a game for young children, like Candy Land or Sorry, and play. Other game options are go fish, war, and crazy eights. While playing make-believe might be pushing it, if you're so inclined and so is your spouse try it! Have a sword fight. Pretend to be pirates. Play doctor (though this may lead to more adult games). Use your imagination and be creative. Think like a kid. You create shared memories. These are happy times you can look back on, especially when life is hard, and remember how much fun your spouse and being married can be. It will give you hope. You laugh and have fun. Having fun will relax you and your spouse and diffuse and tension that may have built up. The theory is, and it's true, that the happier and relaxed you are the less likely you will be to find fault with one another. Fewer disagreements and more happiness in your marriage. You strengthen the trust in your marriage. This is especially true when you play make-believe. Acting like a kid can be embarrassing so when you do you're showing your spouse you trust them not to make fun of or belittle you and vice-versa. You strengthen your relationship of trust this way. Cami loves to color so from time to time I try to sit down and color with her. Coloring helps her relax. And an added bonus is that I get to spend time to her. We can talk while we color or just sit silently next to each other. It really is quite relaxing to color with Cami. The short of it: the secret to having more fun is to play like a child. I think I'm going to go get in my rocket ship now.